The Heritage Lottery Fund (HLF) in 2012 awarded the Friends of Corhampton Saxon Church a grant to help the communities of the Meon Valley bring to life the fascinating story of the Saxons in the Meon Valley. Our charity and our community have since been awarded additional funding and support from the South Downs National Park Authority, Winchester & Hampshire Councils, Corhampton & Meonstoke Parish Councils. The William Collins Trust, the universities of Winchester, Cambridge and Nottingham, the Hampshire Field Club and Archaeological Society, The Council for British Archaeology, the Robert Kiln Charitable Trust. We are also receiving valuable ‘in kind’ and support, expertise and encouragement from these organisations and others including Wizbit Internet Services (our website partner), Winchester Area Community Action, Hampshire & Isle of Wight Community Foundation, Herigeas Hundas (our re-enactment partners), Liss Archaeology Society, Focus Business Communications, The South Downs Society, Wessex Archaeology, English Heritage, Natural England and The Sustainability Centre. We are also learning from experts, and enjoying the Saxon collections, at the Museums of Winchester, Oxford (The Ashmolean), Reading (The British Bayeux Tapestry) and at The British Museum and The British Library. And last, but not least we have had amazing support from many volunteers, village history societies, schools, churches of the Meon Valley and other organisations with shared interest in our common heritage. This has encouraged us to engage people of all ages from the ten villages of the Meon Valley in exploring and learning about the Saxons who lived in the Valley for six centuries, from when the Romans left England in the 5th century, to its conquest in the 1066 by the Normans. We are exploring, learning about and recreating the Saxon way of life and culture; remembering what they have done for us, celebrating their achievements and having fun! WHO ARE THE SAXONS I N THE MEON VALLEY? Our ancestors were the Meonwara (Meon People). They came from what is now Denmark and settled in the Meon Valley after the Romans left Britain in 410 AD. For seven centuries or more (until, and after, the Norman Conquest in 1066) they developed the Meon as a fertile farming valley running from the South Downs at East Meon to the Soluent at Titchfield Haven. Trading vessels navigated the Meon, a Celtic (ancient British) word meaning ‘Swift One’, the name also of one of our local ales! From the Soluent the ships reached as far as Droxford Mill, taking flour and other agricultural produce to the Soluent and the trading ports of Hamwic (Southampton) and Portesmuða (Portsmouth). Saxons also traded in goods from other parts of our Islands, across what we now know as Europe and Asia. A hoard of Saxon gold and silver discovered in 2009 illustrates the extent of Saxon trading. An amateur enthusiast using a metal detector discovered what we now call the Staffordshire Hoard. The hoard includes amazingly crafted artefacts dating back to the 6th century with red garnets from as far away as India or even Sri Lanka. 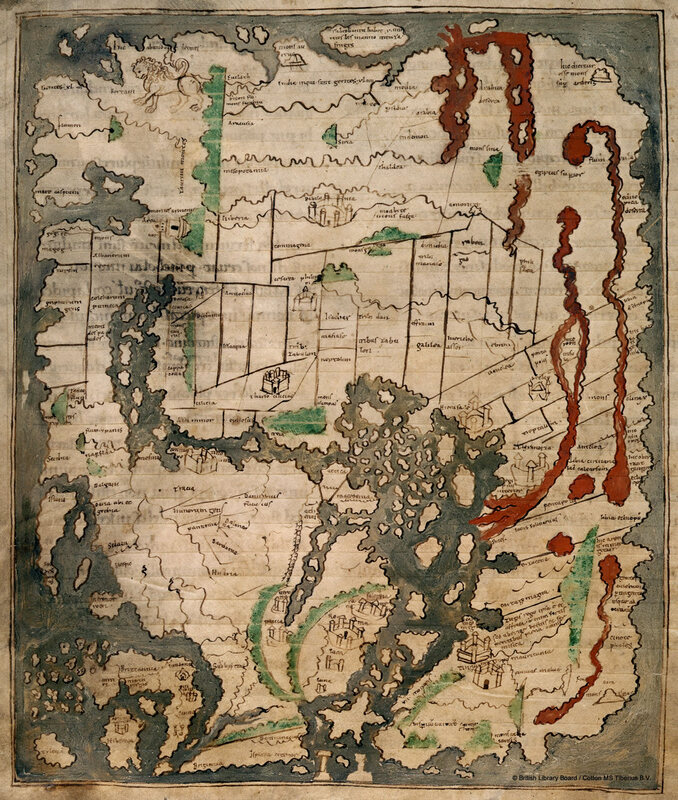 We have included an amazing Anglo-Saxon world view (Mappa Mundi) produced (without GPS etc.) at Canterbury at the time that Corhampton Church was built (11th Century). It is recognisable today as Europe, Africa and the Far East. The image of the map is used with permission of the British Library. The name of our nation (or Englaland as it was first known), derives from people known as Angles who also came from what is now Denmark. The people who settled in the Meon Valley were from the same part of Northern Europe; they were Jutes and Saxons. These Germanic peoples were amongst waves of people crossing Europe in what we now call the ‘age of migrations’. The settlers in Englaland, displacing the Celtic Britons, became collectively known as the Anglo-Saxons or simply Saxons. The Saxons laid the foundation of the English language, and of our culture, religion, system of government, the layout of our villages and our landscape.